In this section we feature stories and experiences from some of our leading disabled activists who are campaigning for change. The current law has long been shown to have failed and a new safeguarded law is needed to put in place protection for terminally ill people and give them choice and control. I have long supported a change in the law on assisted dying for terminally ill people because I feel it’s so important that people keep in control of themselves, even at the very end of life. When facing an imminent and inevitable death, someone should have the right to choose how to control their passing, to be directing healthcare professionals and having the support of friends and family in an environment which safeguards everyone involved. Whether it’s been my grandparents dying or speaking with those who have personally struggled with the suffering of a terminal illness, It’s clear that no one can nor should ever make such a life-ending decision except the people themselves. For one of my grandparents, she no doubt struggled with her final months of her battle with cancer and I cannot know what she would have chosen if given the choice of an assisted death. As a child, I came close to death at one point whilst having spinal surgery. Luckily I survived but did develop a spinal cord injury that means I now use a wheelchair full time. Experiences such as this have shown to me that pain and suffering are two very different things, one can be managed but the other depends on the person. Last time I checked, I’m not dying, touchwood but for the minority who are dying from a terminal illness and whose suffering will soon end in death, why can’t they control how it happens, who is around them, whether healthcare professionals are assisting them or not? Greg works as Campaigns Officer for Dignity in Dying and coordinates DADID’s volunteers and supporters. 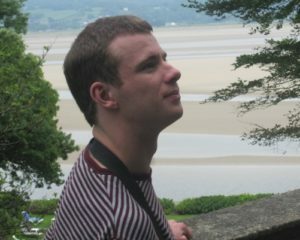 Having graduated from university, Greg has gone onto lead several campaign successes both in and out of party politics. Greg serves as an elected Trustee of a leading disability charity. I started campaigning for a change in the law over assisted dying after my Mother died of cancer on 20th May 2012 after a long fight. As a result, I decided that if I was ever dying of a terminal illness, I would want choice and control over the way it happens. I became a firm believer in Assisted Dying because of my experience of unbearable pain after my accident . There was allot of it. I am still in pain (now manageable) most of the time. At present, I have no intention of dying. But if I have a terminal illness, am dying imminently in any event, and am suffering – I want a way out. I never want to experience (pointlessly) that level of pain again. In 2005, I was working in South Africa and was involved in a major car accident which left me in a coma for several months and in hospital for over two years. I am still getting used to my new life today as a disabled person; walking is more difficult and I can’t sit for very long. But I do make the most of life! I support the legalisation of assisted dying because it will make sure those who are dying (and only who are dying) are given a choice. Just because I’m now disabled, doesn’t mean I want to die! Everyone who is not dying, disabled or not, will be safeguarded: The law just won’t apply to them. Lucy volunteers with DADID. 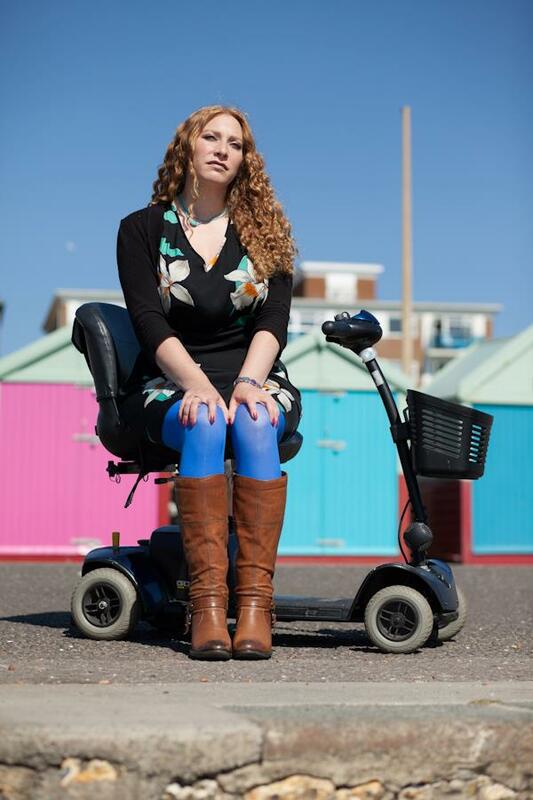 Before an accident, Lucy had a career in law, finance and international development. Lucy lives life to the full and will soon tandem paraglide. Ted Shiress is an up and coming comedian and the writer and ‘star’ of his own web-based series, Cynic. Having coped with moderate Cerebral Palsy all his life he has adopted a ‘think a lot of life, think little of having a disability’ attitude, though the latter is a focal point of his stage-persona. His loves include music, food and comedy (obviously! ), and get him talking about these and it becomes clear that there is no other he’d rather be. Although Ted’s lust for life comes through always he can understand how people can find themselves in a place where life is no-longer lust-worthy. There will be times when someone finds oneself so terminally ill and close to death that the greatest gift they could receive is to be able to skip their last few days of suffering by having the power to control their death as they choose. Furthermore Ted rebuts the ‘slippery slope’ argument that allowing assisted dying will lead to an increase in preventable suicides. It won’t, Ted understands that assisted dying is purely a matter of dignity, and that is why he supports AD with all the necessary safeguards that Lord Falconer’s Bill provides and that DADiD campaigns for. Shana has lived with Multiple Sclerosis since childhood and confronts the many barriers of her condition on a daily basis. She regularly campaigns for various issues involving disabled people and MS, however, for her, having a disability does not influence her support of assisted dying for terminally ill people. “Assisted dying would does not allow people living with long term conditions assistance to decide to end their lives. I would not support that. But I do fully support terminally ill, mentally competent dying people having the choice to control their imminent deaths. Following a traffic accident in 1990, Luke had a spinal cord injury which means he is paralysed and uses a wheelchair. Luke has since lived his life to its fullest. He went to university and was introduced to a contact at the BBC by his university tutor. His acting career has seen him appear in Eastenders, Doctors, The Bill and a key role in Casualty. Outside of acting, Luke has appeared on The Wright Stuff as a guest and is a regular public speaker and coach. He is currently writing a book on his experiences of property investment; ‘I’m The Lucky One’. 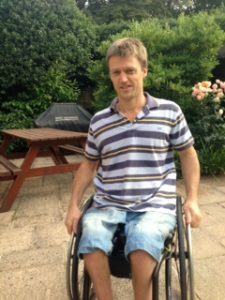 Rob has a spinal cord injury and is a full-time wheelchair user. His injury came after a long career in nursing in which he took up the post of Director of Nursing in an NHS Trust. 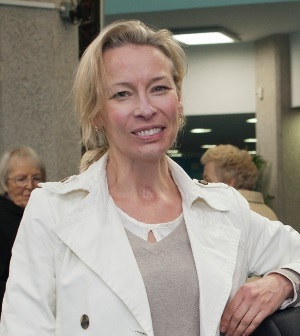 I was diagnosed with multiple sclerosis when I was 32yrs. 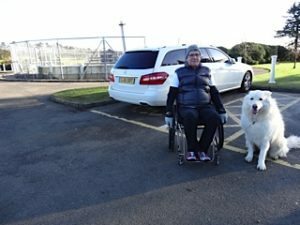 I gradually deteriorated until now at 72 I use a wheelchair all the time. I haven’t worked since I was diagnosed but have been active in the voluntary sector, mainly with disability groups. It just makes absolute sense to me that a dying person should be able to take charge of the time and place of their death. We have spent out lives ‘being in charge’ so to speak and our death should be no different. I can understand some disabled people are worried about the effect this law could have as they have fought so hard to be accepted and get equality in so many areas of their lives; anything that hints of ‘death’ can create a sense of fear. For me supporting assisted dying is also about equality with abled-bodied people so everyone, disabled or not, can have a good death if you are terminally ill and have less than 6 months to live. Baroness Brinton was introduced to the House of Lords in 2011. She was appointed Co-Chair (and Liberal Democrat spokesperson in the Lords) for Health in November 2013. She has had careers in television, higher education and throughout much of her life, a love of politics and representing various constituents. 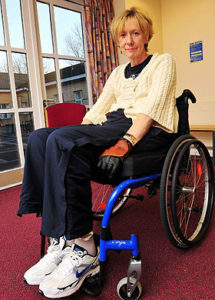 She now has rheumatoid arthritis which means she uses a wheelchair much of the time now. As a disabled woman and a Christian believer, Baroness Brinton has announced her support for Lord Falconer’s Assisted Dying Bill and registered her support of Disabled Activists for Dignity in Dying. I believe that there is no point keeping humans alive just for the sake of it in circumstances which we and they regard as intolerable. And if they need help to achieve a good death, in the comfort and peace of their own home, we should be able to give it to them. Ironic, isn’t it, that we can buy 50 different types of pasta or ice cream? We can choose a million styles of hair, or clothes, holiday destination or car. Tidal waves of consumer choice lap against us every waking minute. Yet when we need help to effect a simple, primary decision to ease out of life; we are denied that choice. Or, if we are able, we must leave the country and go to a grotty Swiss suburb to find it. Melanie Reid is an award-winning Times journalist whose weekly column for The Times, ‘Spinal Column’, is about disability and her life as a disabled person. She broke her neck and back in April 2010 whilst horse riding, and is now tetraplegic. Lord Low was appointed a Commander of the Order of the British Empire (CBE) in the 2000 New Year Honours for services to the RNIB and disabled peoples’ rights. In 2006, he was created a life peer as Baron Low of Dalston, and he sits as a crossbencher. Lord Low is vice president of the RNIB and president of the International Council for Education of People with Visual Impairment. 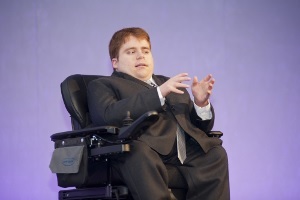 Tom is a renowned academic in the field of sociology, disability rights and bio-ethics. He has lectured in sociology at the University of Sunderland and his PhD degree at Cambridge. He previously co-authored The Sexual Politics of Disability and went onto spend five years working at the World Health Organization in Geneva. He continues to consult for WHO, World Bank and other UN agencies. His own experiences of disability have been invaluable for academic research. Tom was born with the genetic condition achondroplasia which is why he is 4 foot 5 inches tall. The accounts made in the About US section of the Disabled Activists for Dignity in Dying website reflect the views of the authors.